You’ve probably heard some of those famous recordings of the choirs of Buddhist monks who sing very low pitches that create high overtones and it sounds like they are singing chords (more than one pitch at a time). It’s a very ancient method of singing. 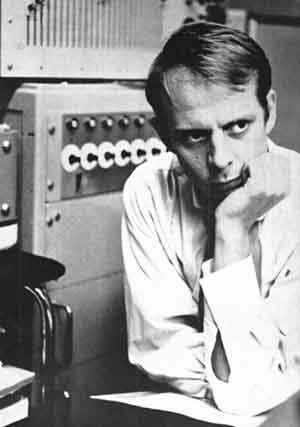 Stockhausen in the old Darmstadt days. The most advanced usage of this type of sound production was heard in a work created in the late 1960s by Karlheinz Stockhausen titled Stimmung. It was written with the Collegium Vocale Köln in mind. The group sat in a circle in a huge hall and each person held a microphone into which he or she sang. The ensemble was then amplified. The basic idea was for the voices to sing the overtones louder than the fundamental pitch they were singing. The only pitches sung for the 70-minute duration of the piece was a B-flat chord with an added 9th on top. In other words B-flat, F, B-flat D, F, A-flat, C.
The effect is quite stunning and at the same time, hypnotic. Recordings of this ensemble performing the work are available through Stockhausen’s website. By the way, he recently died on December 5. 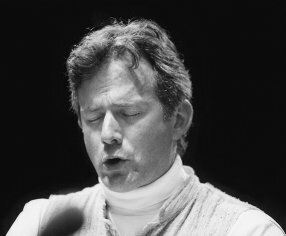 The true virtuoso of this type of singing is David Hykes who had an ensemble called The Harmonic Choir. On the group’s first album, titled "Hearing Solar Winds," he sings a solo titled Rainbow Voice. You’re going to hear an amazing excerpt from the piece, but you need to know what you will hear. First of all, he is the only person singing! However, the harmonics are so loud that you will hear the lower fundamental pitch as well as another pitch several octaves higher. By subtle changes in the vowels he is singing causes the high pitches to change. Listen! Pretty amazing, isn’t it? Want to hear some other weird harmonics? Listen to the old Barbra Streisand song People and listen to her voice at the end and listen for the harmonics you can hear when she gets to "are the luckiest people in the world." Listen carefully to the notes for the phrase "in the." For more info about harmonics, see Room 46. If you need to leave, Go to initial page of site.